This hat is really warm and cozy. 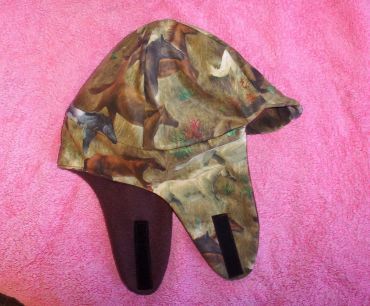 It is fashioned after Musher's Hats. My husband and I ran, raised, trained and bred Siberian Huskies for years. We have worn these hats on the coldest, wettest, windiest days and stayed warm. We have also slept in these hats winter camping. Remember your mother always telling you to wear a hat to stay warm? It is true. If you hands or feet are cold put a hat one. I believe it is something like 15% of your bodies heat is lost from the top of your head. 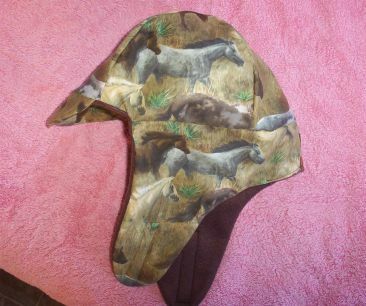 This hat is size Large/X-Large and is made with a cotton blend, Horse Print, fabric and lined with a Good Grade Brown Polar Fleece. It will velcro under your chin or up over your head for warmer days with a generous strip of velcro. It also has a brim to keep the winter sun glare out of your eyes. No two hats are exactly alike. 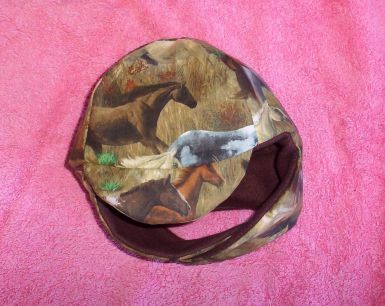 This horse print warm winter hat is machine washable and dry able, but I hang them to dry. If you like the print buy it. Fabrics are not always available and sometimes I only buy a very small amount. The hat is new and has never been worn. It was made new in our non smoking home. Sorry it is not returnable and is not refundable....if however there is a craftsmanship error we are more then happy to repair or replace the item with as close of fabrics as we can find at the time.